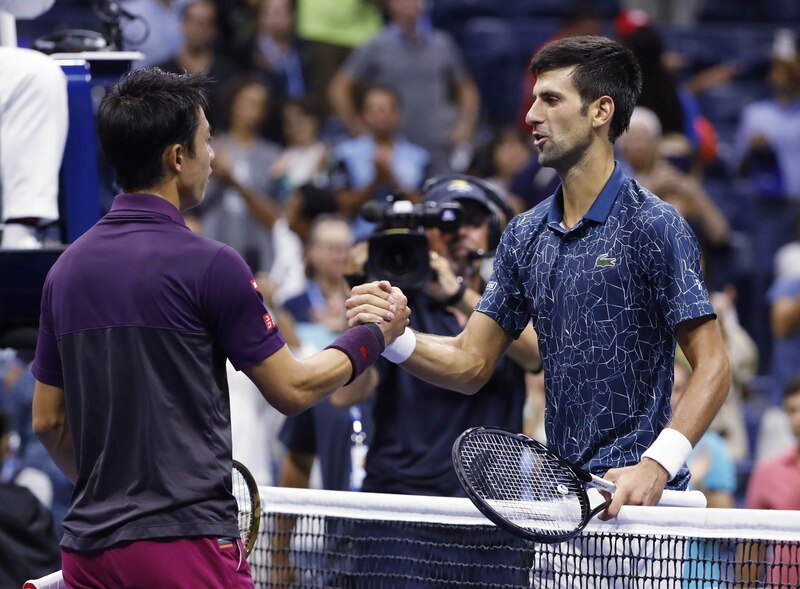 Novak Djokovic of Serbia, shakes hands with Kei Nishikori of Japan, after Djokovic defeated Nishikori during the semifinals of the US Open tennis tournament in New York on Friday. Juan Martin del Potro set up a US Open final clash against Novak Djokovic on Friday after defending champion and world number one Rafael Nadal quit his last-four clash against the giant Argentine with a knee injury. Del Potro will now face Djokovic, the 2011 and 2015 winner, who reached his eighth final at the tournament and 23rd of his Grand Slam career with a 6-3, 6-4, 6-2 stroll past Japan's Kei Nishikori. Djokovic boasts a 14-4 lead over Del Potro in a 10-year rivalry, including two wins without dropping a set at the US Open in 2007 and 2012. "We have never met in a Grand Slam final. I have tremendous respect for him as a person and a player. He's a great guy," said Djokovic who missed the 2017 tournament through injury. "He's had lots of injury problems in the past but he's a big-match player." "I hate to retire," said Nadal, a player plagued by a series of knee injuries throughout his career. "It's not a tennis match when one is playing and the other is at the side of the court." That included almost five hours to defeat Dominic Thiem in an epic quarter-final which stretched into the early hours of Wednesday morning. The effort took its toll, with the Spaniard twice needing to have his right knee bandaged before calling it a day after the conclusion of the second set. "Well of course it's not the best way to win a match. I love to play against Rafa because he's the biggest fighter in this sport and I don't like to see him suffering," said 29-year-old Del Potro who will be playing in his second Slam final. "I am sad for him but I'm also happy to do my best." Nadal's challenge looked doomed even as early as the first set, as he was feeling the injury after just four games, he admitted. But the Argentine swept through the tiebreaker, wrapping up the opener after 69 minutes of impressive shot-making. "It means a lot to be back in the final," added Del Potro after his sixth win over Nadal, all on hard court. "I didn't expect to get to another Grand Slam final in my favourite tournament. "I had my biggest memories on this court in 2009 when I beat Rafa and Roger (Federer, in the final). I was a kid then; now I am much older." Wimbledon champion Djokovic, playing in his 11th US Open semi-final, claimed a 15th win in 17 clashes against Nishikori.